Despite the introduction of DVI and HDMI the common VGA connection is still the primary connection for most computer monitors. This double-shielded cable is designed to handle analog VGA and extended VGA resolutions. It features gold-plated male DE-15 (aka HD-15 or DB-15) connectors on each end for smooth corrosion-free connections. It includes ferrite cores at each end which ensure that EMI and RFI interference will not enter your video system. 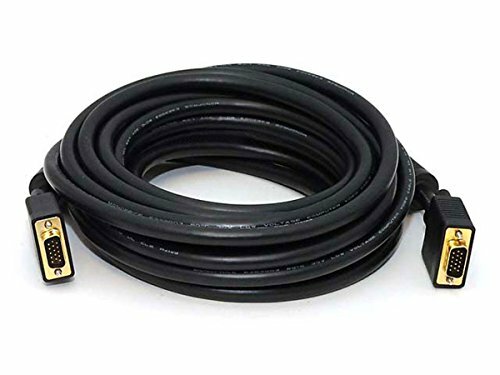 This cable is CL2 rated which indicates that it complies with fire safety and insurance standards making it safe for use through or within the walls of residential class buildings. HDMI the HDMI Logo and High-Definition Multimedia Interface are trademarks or registered trademarks of HDMI Licensing LLC in the United States and other countries.